Golden Bough (Mistletoe) - Beneficial to help calm nerves, supports a healthy nervous and circulatory system.*. Viscum flavescens. GOLDEN BOUGH ( MISTLETOE ) - The leaves are the parts used, not the berries. As such, they are beneficial to your health, contrary to what you may have been taught. This is like the old problem with the potato, the part you eat comes from under the ground and is a good food. If you cook and eat the part that grows above the ground it can kill you. You don't fear eating potatoes, and you need have no fear of adding mistletoe leaves to your diet. Mistletoe is for nerves that are worn to a frazzle. If you feel like crying when someone points their finger at you, it's Mistletoe time. Due to our ancestral memory, many of us do still associate this plant with joy and well being at Christmas time. 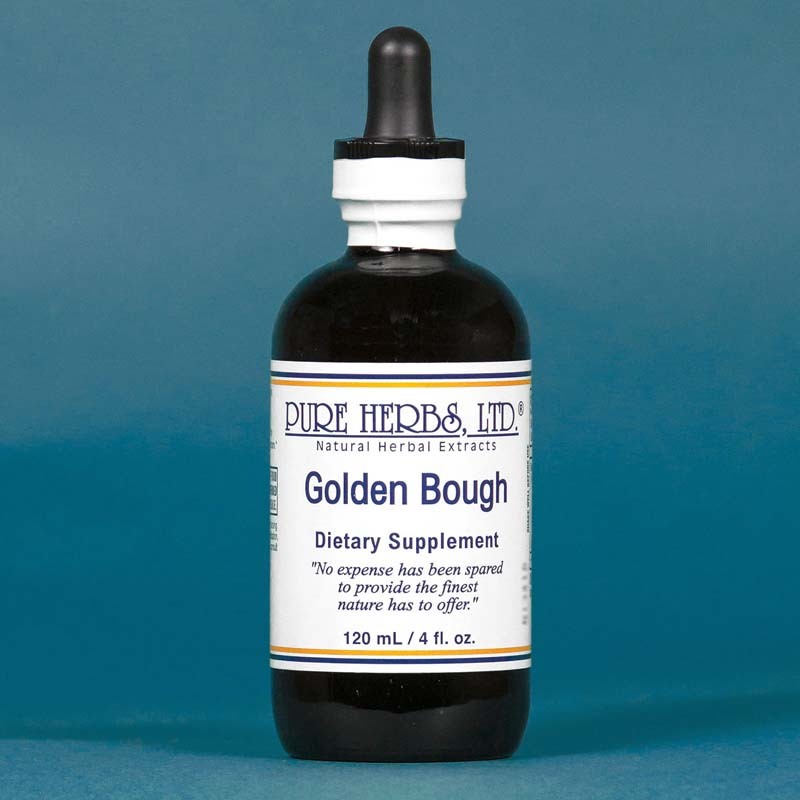 To lower chronic high blood pressure due to nervous tension and to correct balance problems and epilepsy, nervous system instability, anxiety, paralysis, weak pulse, poor outflow of blood with each heart contraction (tired from walking across the room), enlarged heart and water retention, put 40 to 80 drops of Golden Bough along with an equal amount of Herbal Adj. in a cup and drink it as needed. Mistletoe, among its other virtues, is a beautiful storehouse for the mineral element zinc, which prevents the formation of certain cancers. In Germany, Mistletoe is given medically to post-operative cancer patients to raise their immunity and thus prevent reoccurrence of the cancer. Let's take it now and avoid the problem altogether. * DOSE: 5 to 40 to 80 drops every 4 hours, while awake, as needed for crisis periods. 40 to 80 drops daily for maintenance.